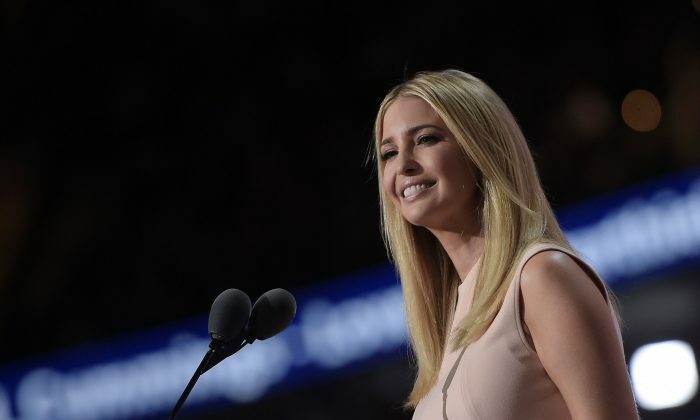 Ivanka Trump took the stage to introduce her father on the night he accepted his nomination at the 2016 Republican National Convention in Cleveland on Thursday. In her speech, Trump’s oldest daughter tried to appeal to millennials, women, and minorities by arguing that her father is compassionate and caring. She compared herself to “fellow millennials” in the speech saying she did not consider herself as Republican or Democrat, but that she has voted on what she believes is right. “Sometimes it’s a tough choice. That is not the case this time,” she said. Trump’s daughter said her father cares about minorities and that she has seen it first hand at his job sites. She also said her father has been a champion for women’s equality for quite some time now. “At my father’s company, there are more female than male executives. Women are paid equally for the work that we do and when a woman becomes a mother, she is supported, not shut out,” she said as people at the convention cheered. Ivanka then went on to talk about the gender wage gap and motherhood. “As researchers have noted, gender is no longer the factor creating the greatest wage discrepancy in this country, motherhood is,” she said. Ivanka said her father will change labor laws that were implemented when women were not a significant part of the workforce. She also said he will focus on making quality child care affordable and accessible for all. Ivanka, who has three children, then pointed out that like many women in America, she is also a working mom. “I know how hard it is to work while raising a family. And I also know that I’m far more fortunate than most. American families need relief. Policies that allow women with children to thrive should not be novelties, they should be the norm. Politicians talk about wage equality, but my father has made it a practice at his company throughout his entire career,” she said. However, the presidential nominee has failed to win women over after a series of high-profile gaffes. His image among U.S. women is strongly negative, with 70 percent of women holding an unfavorable opinion, an April Gallup poll shows. “Other politicians see these hardships, see the unfairness of it all, and they say I feel for you. Only my father will say, ‘I’ll fight for you,'” she said. She ended her speech by comparing her father to hard-working Americans. “He is tough and he is persevering. He is honest and he is real. He’s an optimist and he’s a relentless believer in America and all of her potential. He loves his family and he loves his country with his heart and his soul,” she said.